What's a hulu? In August 2007, this question ricocheted through the blogosphere to a chorus of derisive laughter. Fox and NBC were going to make the Internet safe for television! They were building a "YouTube killer"! And they were calling it Hulu! It was almost too perfect—an absurdist topper to the idea that two major broadcast networks could devise an Internet video service people would actually use. The name was even more delicious than the venture's placeholder moniker, NewCo., which the online world had changed to Clown Co. And now Hulu? It means "snoring" in Chinese, one blogger declared. "'Cease' and 'desist' in Swahili," Michael Arrington reported on TechCrunch. "Perhaps they should have just stuck with Clown Co.," he added. On a summer evening in Santa Monica, Kilar is sitting in a cafè9 near his house, reminiscing about the vintage anime series Speed Racer . As a kid, he was one of the millions who used to rush home from school every day to watch the hero's Mach 5 blow by Racer X. "It came on at 3:30," Kilar says, "and if I was late, I missed it." At the time, the business that Fox and NBC Universal had in mind was still poorly defined. "It started out of frustration that other people were using our video online and creating a business," Zucker says. A year earlier, NBC had forced YouTube to pull clips of Saturday Night Live 's "Lazy Sunday" skit, even though it was sparking new interest in the show. YouTube complied; pirate sites didn't bother. The networks needed to find some way to keep others from grabbing their shows—and their profits. But the companies were too accustomed to competing with one another to form a common strategy. Disney, corporate parent of ABC, joined talks for a while but opted to focus on its own Web business rather than join forces. CBS and Viacom (which owns MTV and Comedy Central) decided to invest in Joost, an online-TV startup from the Net-savvy guys behind Skype and Kazaa, and Viacom hit Google, which had just bought YouTube, with a $1 billion lawsuit for good measure. That left Fox and NBC Universal to team up on some sort of Web video service. Chernin and Zucker were still trying to figure out what it would be when news of their plans leaked out, forcing them to make a hasty announcement. For the next 10 weeks, as Feng and his team raced to build the service, Kilar focused on getting more shows. He kept a color-coded spreadsheet—green for yes, yellow for maybe, red for no—that listed every property Fox and NBC Universal controlled, with details about every remaining legal hurdle: Are the rights owned by the network, the producer, or a third party? Can we clear all the music? Each new green was celebrated. One by one, they picked up cult favorites like 30 Rock , Buffy the Vampire Slayer , and Battlestar Galactica . Almost the last to go green before Hulu's beta launch at the end of October was one of the shows they had focused on most: Arrested Development , which Fox had canceled due to poor ratings despite multiple Emmys and heaps of critical acclaim. Two months later, Hulu edged ahead of ESPN.com to become one of comScore's top 10 US video sites. Its growing popularity led Viacom to offer recent episodes of The Colbert Report and The Daily Show With Jon Stewart , two of Comedy Central's most popular programs. Meanwhile, the accolades were pouring in. Users and critics alike praised its straightforward design and even the way it implemented ads. Entertainment Weekly called it "some kind of TV addict's fever dream." "This is the entertainment we've all been looking for," one user wrote in to the company. Another declared simply, "You have done something great." Hulu had gotten online TV right. So much for Clown Co. The big question now is, can Hulu turn a profit? Hulu isn't releasing any numbers, though Dobron says its revenue will "dramatically exceed initial forecasts." The only credible outside guess seems to come from Michael Learmonth at Silicon Alley Insider , who estimates that Hulu will generate between $45 million and $90 million in advertising in the year following its launch. Since he estimates that 70 percent of that money goes to content providers, this doesn't leave much for operating costs. And while Hulu gets two to three times the ad rate that the broadcast networks command, that's on a cost-per-thousand-viewers basis. Hulu says its highest-rated shows get "millions of streams" per month, but a popular show like CSI will draw 16 million viewers on TV in a single night. Worse yet, from a financial perspective, part of Hulu's bargain with users is fewer ads: While broadcasters cram eight minutes of advertising into a half-hour show, Hulu sells only two. In the meantime, Hulu provides a tantalizing glimpse of the future of television. 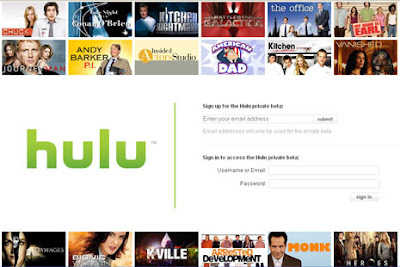 Unlike the networks, which have always been carefully programmed by their executives, Hulu is programmed by user choices and recommendation software. Schedules don't matter; popularity alone will bubble a show to the top. The results can be startling. One of Hulu's top five shows is It's Always Sunny in Philadelphia , an FX series starring Danny DeVito that has never gotten much attention on TV. Another is Arrested Development . Hulu isn't saying exactly how many people watch a given show, but the numbers are high enough that Kilar is becoming a must-see guy for producers. Joss Whedon, who created such shows as Buffy the Vampire Slayer and Angel , popped in to talk about Dr. Horrible's Sing-Along Blog , his three-part video—which Hulu got as a Web exclusive. Family Guy creator Seth MacFarlane met with Kilar over the summer to chat about how well his show has been doing. As usage grows, Kilar can expect many more such tèAte-è0-tèAtes.